Posted by Teresa Mihelic HelpDesk on Monday, October 8th, 2012 at 12:35pm. In any market, in any season, real estate agents often make it a point when explaining how to show cast your Orange County home for sale. And the first thing we always go on and on is on that 'curb appeal'. It got so important during the 'boom' years, that even TV shows came out with the name. What is Curb Appeal? Is the first impression, everyone -- including potential home buyers -- will get from your home without seeing the inside. Curb appeal is extremely important when selling a home. It will make the buyers want to see what's inside...or 'skip it'. Buyers will make assumptions on what your home is like on the inside from the exterior appearance. It happens for sure in the Orange County real estate market. Sometimes, home owners will forget about this one super important factor when getting the house ready for sale and showing. But think about it for a second: most buyers look online first, and many will 'drive by' properties before they call an agent to have a showing of the homes. So a home could be perfectly presentable in the inside, but that 'curb appeal' might be a deal breaker if the potential buyer didn't get a good impression of the home in the first place. The human mind sees what it expects to see, and seeks for evidence that it's correct. Seeing neglect outside leads to seeing neglect inside, even if they have to search for it. 1. 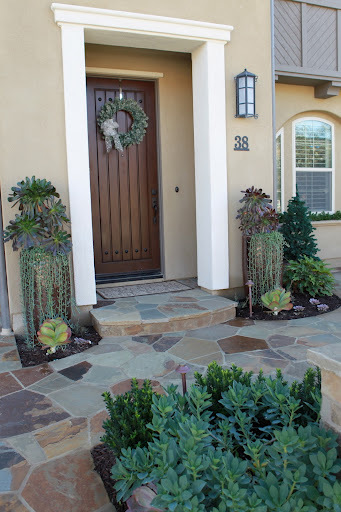 Create Symmetry: a plant on each side of the door - or lamps, or your preferred decoration. Symmetry is not only pleasant to the eye, but real easy to accomplish. 2.Dress up the Front Door: your home's front entry is the focal point of its curb appeal. Fresh paint might just do it, but if you have dated fixtures (lock set, mailbox, lights), you might want to replace them ( and have them coordinate). Those seconds that the clients have to get their first impression of a home, while waiting for their agent to open the lock box, are extremely valuable. And nothing worse if they notice their agent having a hard time trying to open the door due to an old lock. They will instantly set 'one negative' factor about the home without even thinking about it. 3.Instant garden: don't need to brake the bank. Adding a touch of color can be as easy as buying 'container gardens' from your local store. Plants give that calming effect that results in a positive experience. For most landscapes, a staggered, asymmetrical arrangement works best to create a dynamic setting. If you are considering on selling your home you might want to consider those quick tips. Remember you wan to set the right expectation from the potential home buyer from the start. The curb appeal of your home will not only be the fist thing they will see, but the last one too, as they leave your home. Check out our Orange County MLS listings to get ideas on how others have accomplish that curb appeal. And remember, we are experienced agents in Orange County. Are you ready to sell your home?